Every year, I teach a course on U.S. women’s history. Every year, I poll my students to find out how many of them encountered any kind of women’s history in their pre-college educations. 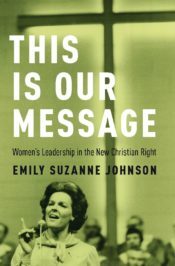 They invariably say that they didn’t learn enough about women (this is a self-selecting group after all), but they also easily recite key components of U.S. women’s history: the Salem witch trials, Sojourner Truth, the nineteenth amendment, Rosie the Riveter, second-wave feminism, among others. These lists don’t capture the complexity of U.S. women’s history, but they represent a substantial and significant change over the past forty years. In the 1970s, history classes barely talked about women. Even among historians and museum professionals, the question of women’s history as a respectable subfield was still very much open. When John Mack Faragher published Women and Men on the Overland Trail in 1979, one reviewer remarked that the “somewhat inverse title of this book is doubtless designed to arouse curiosity and boost sales.” For many historians, raised in a school of thought that emphasized the historical achievements of Great Men, women’s history seemed secondary and even frivolous. When Joan Wallach Scott asserted in the American History Review in 1986 that gender could be “a useful category of historical analysis,” her work represented a paradigm shift. It was in this context that Women’s History Month was born. As the first generation of women’s historians fought for recognition in their profession, most were also engaged with feminist activism outside of the academy. They were among those who lobbied the United Nations to recognize International Women’s Day, which it did for the first time in 1974. The date – 8 March – had long been significant for socialist feminists, as the anniversary of Soviet women’s suffrage in 1917. In the 1960s, it took on broader meaning for diverse feminist groups around the world. After the United Nations recognized 8 March as International Women’s Day, the date became the focal point for broader celebrations and observances, including local Women’s History Week festivities across the United States. In 1978, the Sonoma County school district organized such a successful Women’s History Week that it caught the attention of several leading feminist scholars. Among these scholars was Gerda Lerner, a founding member of the National Organization for Women and the 1980-1981 president of the Organization of American Historians. Inspired by the Sonoma observance, Lerner and others moved to establish Women’s History Week celebrations in their own communities. They also lobbied for federal recognition and achieved it with remarkable speed. In March of 1980, President Carter officially designated the week of 2–8 March, 1980 as Women’s History Week. His proclamation quoted Lerner and reiterated his support for the Equal Rights Amendment (which was then in the process of ratification, though it would ultimately fail). He also declared women’s history to be “an essential and indispensable heritage from which we can draw pride, comfort, courage, and long-range vision.” By 1987, feminist activists and congressional legislators expanded the celebration to encompass the whole month of March. Now, every year, the president issues a new declaration designating March as National Women’s History Month, accompanied by a speech about the significance of women’s history. Across the country, museums, schools, libraries, community organizations, and media outlets take the opportunity to highlight women’s histories. Even more significant, women’s history has gained broad recognition both within and outside of the academy. In many primary and secondary schools, women’s history has become a part of the curriculum. It is the subject of popular books, documentaries, miniseries, and museum exhibits – in some cases, whole museums! It is also a vibrant field of study among professional historians, who have uncovered and continue to uncover diverse histories of women in virtually every place and era. In my own subfield, historians have turned their attention toward the histories of conservative women, many of whom strenuously opposed the same feminist activism that helped to establish women’s history as a legitimate pursuit. Though they may have disagreed with the feminist motivations of the field’s founders, they made undeniable political contributions that demand historical attention. Of course, there is still more that can be done. There is more research to do and there are more stories to tell. We can do more to nuance and diversify public understandings of women’s history, and to continue to insist that these efforts matter. But as we close the door on one more National Women’s History Month, it is also worth looking back to see how far we’ve come. Featured image credit: “Autumn at TEDS” by Andrew Seaman. CC0 via Unsplash. Emily Suzanne Johnson is an assistant professor of history at Ball State University in Muncie, IN, where she teaches courses in American history and histories of gender and sexuality.